While Mark Schroeder has been concentrating on sculpture and photography for the past ten years, he has also been a life long freelance technical illustrator and retoucher, doing it digitally for the last twenty years. His clients have included some large corporations such as IBM, Varian and Peterbuilt, to name a few. Mark's sculpture usually starts with wood turned on a lathe and is then combined with other materials such as steel, Densite plaster, electro luminescent wire and neon. The subject matter is drawn from life: plant, animal and human. His photographs are large format digital prints on canvas. They can, however, be done any size or on paper with archival materials. 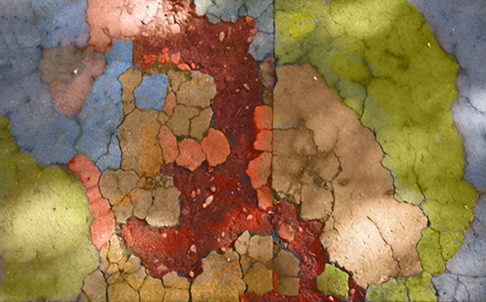 The subject matter is the cracked sidewalks of Alameda, California, his home town. They are heavily edited in Photoshop to form a colorful composition which stands as a metaphor for the cracked ecology of our planet. The act of turning these photos into something beautiful is also a metaphor for saving the planet.